The sewage leak detector DC 420 is a precise. multifunctional device for registration of any kind of differential pressure, absolute pressure, humidity, temperature. The extremely large dynamic range of the sewage leak detector allows besides highly sensitive measurements of smallest pressures in Pascal-ranges for gas tension- and compression measurements also the leak detection of sewage-pipes according to EN 1610. 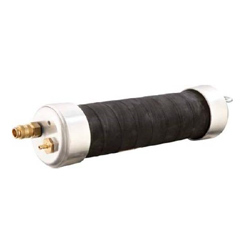 A maximum measuring range of up to 2 Bar and a bursting pressure of 3 Bar guarantees enough safety even for higher pressure ranges. During all measurement the operator is navigated through the process by orders written on the display. Thus the sewage leak detector can be also used for (room-) climate measurements. Therefore in addition to the pressure sensor there are also serially a temperature sensor and optionally a humidity sensor integrated. 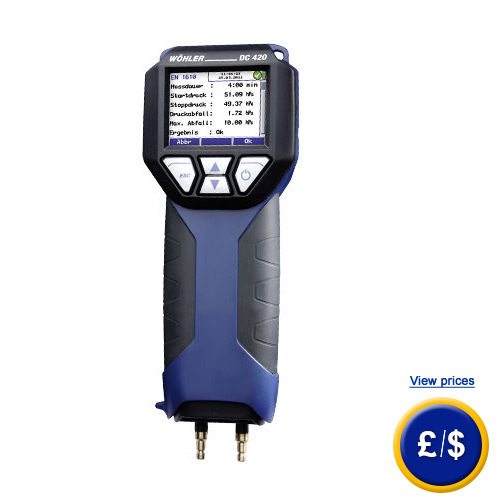 Furthermore the application range of the sewage leak detector can be extended by an external temperature sensor. All values can be logged for up to several years depending on the chosen sampling rate and be transferred via an integrated USB interface to a computer. If there have one or more measurements been performed, they can be assigned to the relevant customer via the menu navigation. Measuring protocols can be printed, even with the company's label, right away on an optionally purchasable thermal printer. There can be also switched-on a continuous data transfer via the setup-menu, so that during the measuring procedures all four values (pressure, temperature internally and externally, relative humidity) can be transferred to a computer with the relevant channel numbers. The extremely low power consumption of the sewage leak detector is caused by a brand new processor technology, where the power consumption is adjusted to the measuring task dynamically. Even within the operation mode with maximum power consumption (6 mA) a continuous operation time of more than 300 hours can be reached due to four mignon cells, type AA. Within the logger operation mode the operation time can be even enhanced to several years (4680 measurements) by alternating the interval to 4 hours between the measurements, without any battery change or using up the storage capacity. The sewage leak detector can be applied for gasiform mediums (air or inert gas) as well as for liquids, such as water or heat oil. Therefore it should be considered that remains of the liquids within the pressure ports might falsify the measuring results. Therefore the sewage leak detector should not be used for measurements of gasses any more after it has been used for liquids already. In case that you should have more questions regarding the Sewage Leak Detector DC 420, please read the following technical data, use our contact form or call us: UK customers +44(0) 23 809 870 30 / US customers +1-410-387-7703. 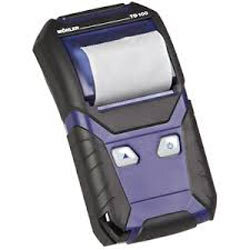 Our technicians and engineers will gladly advise you regarding the leak detectors or all other products in the field of Control Systems, Laboratory Equipment, Measuring Instruments or Scales and Balances of PCE Instruments Ltd.
(with 1 role thermal paper and 4 batteries) to print the results right away (e.g. to document the measuring data at sight). 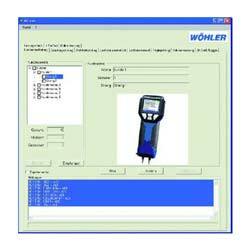 The Wöhler analysis computer software is made for evaluation of measuring data of the Wöhler DC 410, DC 420, DC 430 as well as the Wöhler DP 600.